UK's racing genoa is a tri-radial construction made with either black aramid fibers or black polyester fibers. UK Sailmakers' Catalina 22 sails are designed by Pedro Gianotti to be fast and easy to trim in all winds and sea states. All of our sails are made using the best materials on the market and are designed with the must advance software which allows us to constantly monitor and change our own designs and tuning guides. Along with being designed for speed, our one-design sails are built to last. 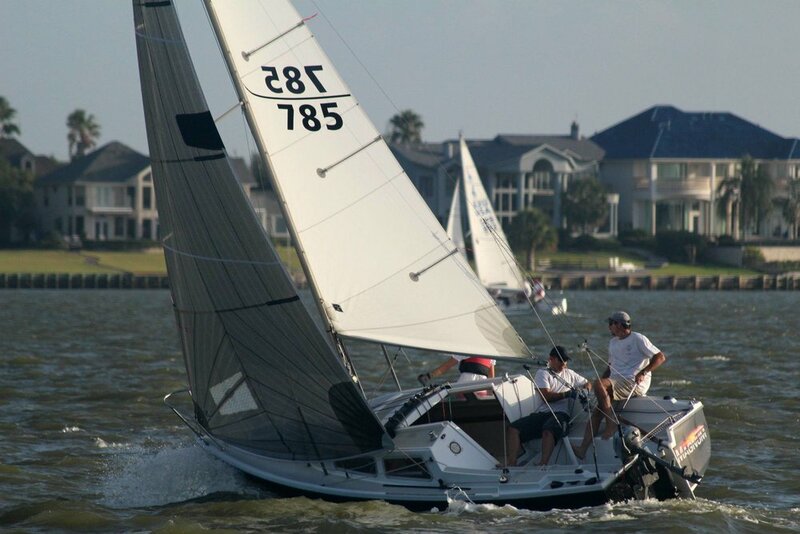 Ben Miller sailing at the 2013 Catalina 22 Nationals, which he finished 3rd at in the Gold and Spinnaker divisions. 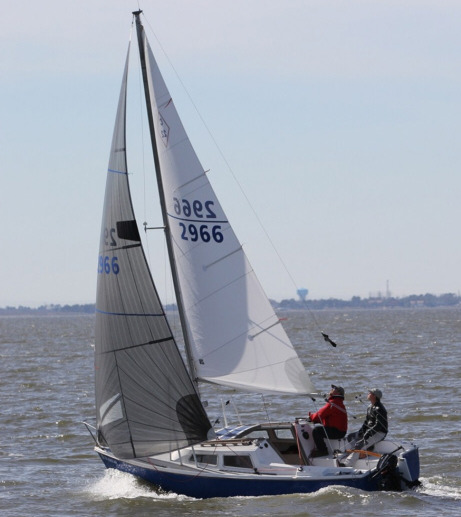 The Catalina 22 Mainsail BM model was developed for Ben Miller an active class sailor 3rd at the 2013 nationals. Sail is made of stiff Dacron HTP from Dimension Polyant , 5.4oz at Foot and Head and 4.7oz in the middle section allowing a balanced shape in all conditions. Set on mast with slides allowing more sail area and easy handling and foot loose configuration with max class round to help downwind performance. The tri-radial cut AP Genoa can be made out of two different laminates: Black Aramid or Pentex. The choice is a budgetary one. The Black Aramid Genoa is made with Dimension Polyant's BX05, which is a light material with very low stretch. The Pentex genoa is made of Dimension Polyant's PE05 & PE10 in the high load sections of the sail, which allows for more durability. No matter which laminate you choose, an 8oz luff tape stitched to the sail with tension, which allows perfect luff shape control. Webbing strap hanks are standard. Standard Features: Telltales and visibility windows, draft stripes and spreader patch. The Catalina 22 Jib is made from Dimension Polyant's 6.4 oz High Aspect Dacron cut into cross-cut panels with radial patches. The design has a shorter luff in order to lower the clew for better performance upwind. The 8 oz. luff tape is stitched under tension allowing perfect luff shape control. Bronze bronze hanks, telltales and draft stripes are standard. The AP Runner for the Catalina 22 is designed with max girth at 50% in order to have maximum sail area with big shoulders for downwind legs. The AP Runner is built with Bainbridge Sailcloth's MP75 Nylon. Sail numbers and sail bag are included.